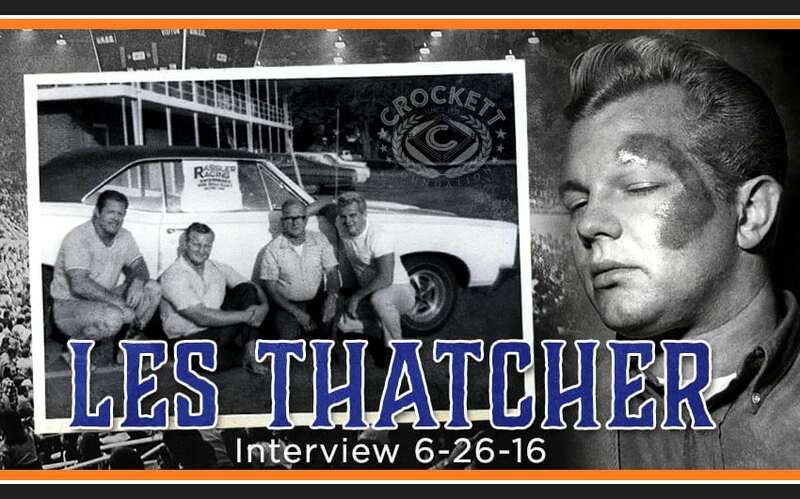 Les Thatcher: The One Bad Decision I Made while with JCP | Crockett Foundation - Tag In & Help Out! Mike Johnson of pwinsider.com has done an amazing interview with Les Thatcher, a legitimate wrestling Hall of Famer. This interview encompasses Les’ many years with the National Wrestling Alliance and specifically his time with Jim Crockett Promotions. Les worked with Jim Crockett Promotions beginning in 1963 as a wrestler for the great Jim Sr. himself and eventually also worked in every facet of the wrestling business at Jim Crockett Promotions. In those days of wrestling, you had to have references to come to a territory. Les tells the story of how the legendary Sandy Scott of the Scott Brothers and 2 others vouched for him so that he could come to Charlotte for his initial swing through the Jim Crockett Promotions territory. In 1963 Jim Crockett Promotions was most notable in the National Wrestling Alliance for its tag team matches. There would be typically be 2 tag team matches on each card. With such famed tag teams as the Scott Brothers, the Assassins, etc… Les was thrilled to come to the territory to learn tag team wrestling which is very different than singles wrestling. The territory was divided into north and south. North would have included Norfolk, VA and Richmond, VA. South would have included Charlotte, NC and Spartanburg, SC. Les’ time in 1963 was short but that is the way it was then. Young guys had to go from territory to territory to learn the proverbial ropes. He would later return in 1967 when JCP’s stable included George Becker, Johnny Weaver, The Infernos, Amazing Zuma just to name a few. The angle built up to a 6 man tag team match on Christmas Day. A young Les Thatcher was nervous about his ability to put cheeks in the seats and discusses how he learned that it not only was a full house but the largest wrestling crowd to that date. That evening culminated with Les having fire thrown on him and his eyebrow singed off. He tells of his first meeting with Jim Crockett, Sr. and describes the 2 sides of Jim, Sr. Charitable on one hand but stern on the other. As he tells the story of the one time a ran afoul of Jim, Sr., you can almost hear a little grin come across his face. It was a different time then and getting reprimanded in front of a group was the norm. Les reveals a conversation he had with Big Jim as he was leaving for Christmas break in the winter of 1971. Les went into Jim’s office to wish him a Merry Christmas and thank him for his support and Jim’s answer was “Hey baby, do me a favor and don’t tell anybody. You’ll ruin my reputation.” Jim Sr. was not about the money you needed he was about the help you needed. Back in those days, wrestling shows were weekly not every couple of months like they are now. A typical schedule for the wrestlers went something like this: Monday-Charlotte, Tuesday-Columbia, Wednesday-Raleigh TV, Thursday-Norfolk, Friday-Richmond and Saturday-Roanoke. The wrestlers drove to all of these matches and chipped in 2 cents a mile for travel cost. As Les explains, running shows on Sundays did not start until the late 70s. As Les takes us through the astonishing career he had in wrestling and his history with the National Wrestling Alliance and Jim Crockett Promotions, he weaves an insider view of wrestling at that time. The time in wrestling when deals were made with a hand shake not a contract. Les’ secret desire to be a disc jockey lead him to an interest in announcing wrestling matches. That and getting to know Gordon Solie. He met Gordon in Tampa and was enthralled with the way Gordon announced. Most announcers in those days were the local weather man or reporter. Bob Caudle, one of the Crockett Foundation’s Tag Team Partners, was a local reporter in Raleigh. Les liked the way Gordon commentated on wrestling just like someone would announce the Super Bowl. In one section he explains what it took to make the spots for the television shows each week. Every Monday Les would come into the offices of Jim Crockett Promotions and go over all the matches and wrestlers scheduled for the upcoming week. There were no tele-prompters in those days so all the weekly matches had to be written down with a grease pencil onto idiot sheets so they could be easily read for the spots. Les would then have to produce 2, 2 minute and 20 second spots for each of the towns running that week in Raleigh every Wednesday. He eventually got so adept at it that he no longer needed to back clock to signal the end of the 2 minutes and 20 seconds. A little known fact divulged in this interview is that Les along with the Brisco Brothers and Thunder Bolt Patterson started the first wrestling t-shirt business. The name of the business was Brutes & Associates and the young man who did the pen and ink for the business was Jerry Lawler. As most of you are aware that simple idea spawned many NWA merchandise sales through the years. When asked what he learned most from his time with Big Jim, Jim Jr., David and Frances Crockett, he had a few things not just one. Details always pay attention to the details. If you don’t believe the story, no one else will. Never drive a car that is more expensive than the car the people that are paying your bills can afford and finally that Big Jim was all about business because it was a business. The Crockett Foundation would like to thank Les Thatcher and Mike Johnson of pwinsider.com for taking the time to record this interview for us. I would like to also personally thank both of these fine gentlemen as president of the Crockett Foundation for taking all of us on a trip down memory lane. The support of men like this and our other Tag Team Partners Ricky Steamboat, Nickla Roberts, Bob Caudle, Sgt. Slaughter, Rock n Roll Express, JJ Dillon and let’s not forget Tommy Young are making the Crockett Foundation’s ability to reach out to veterans easier. As we continue our quest to help homegrown veteran charities and support veterans on an individual basis, I would like all of you to Tag In to Help Out by making a donation or by purchasing our swag at at our online store. Again, thank you to all of you that went back, way back with Les and Mike! Excellent interview with a man that has literally done it all in wrestling and for JCP as well. Les Thatcher’s voice calling Mid-Atlantic Championship Wrestling (as well as Southeastern Championship Wrestling) is part of the soundtrack of my youth, and he was such a huge part of my Saturdays as a youngster. We are big fans of Les at the Mid-Atlantic Gateway! And no one better to conduct that interview than the amazing Mike Johnson. A wonderful addition to the Crockett Foundation website; I hope there will be more audio interviews like this in the future. Dad worked in Charlotte for a few years as well.